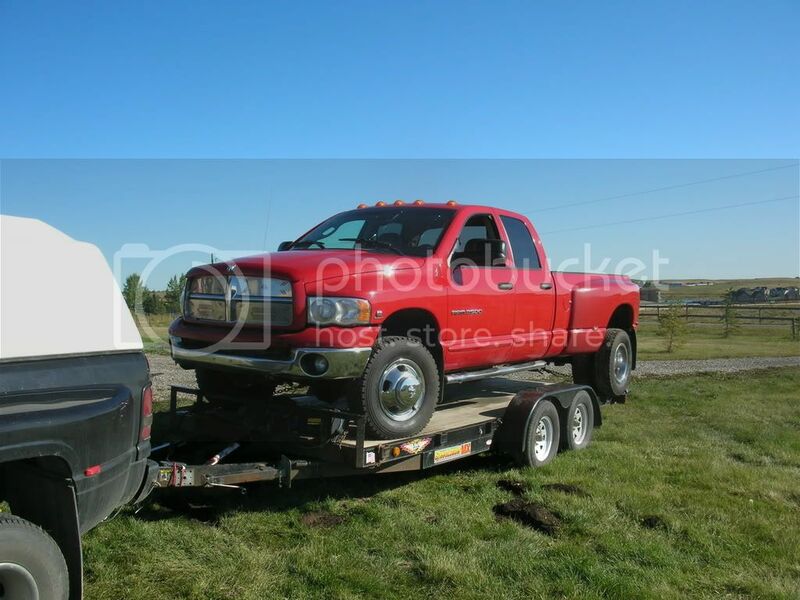 Just picked up this 2003 3500 and need an engine for it or a place in Calgary that rebuilds them. Could go to Red Deer as well, or Edmonton if I was REALLY desperate. Those H&H trailers are tougher than they look....... I'm glad I went to a heavier duty tire on it though. Anyone else thinking a 12v? How did the motor die? You lose the #5, #6 cylinders. I've heard a few that have died the same way. I am with Tate on this, a good 12valve would be a great conversion. All the engines I have seen were in Ab have been 8-10 grand to buy. I have only seen 3 of them. I have a good '01 24V for sale??? Sorry Tater, got to sell this one as a complete running engine. Jamie, you holding out on me. I'm interested. Is it in good running condition? How complete. PM me your PH# and I'll call you later in the week. I have to see, I'm still kinda dreaming about slamming a 6.7L into the old girl. Just waiting for painless to put together a wiring harness. Saw a few wrecked 6.7L trucks on ebay that sold cheap. Clay, look on ebay, awhile ago I had found a couple that were around 4 grand complete and running. Hello Clay-long time no see. I used to cross paths with you back when you and I were into Cherokees. I still have my old gray one-parked out back rapidly deteriorating now. Check these guys out if you're looking for a new one-not sure what they have now. http://www.rj-performance.com/ They have a warehouse in Calgary-my brother bought a 12 valve head through them a few years ago that worked out OK. I will also have a good running '01 24 valve engine for sale soon. It needs to be resealed as it's slobbering out of the rear main and between the gear case and block . I'll be listing it once I get the gaskets replaced. Ran like a champ before I pulled it. 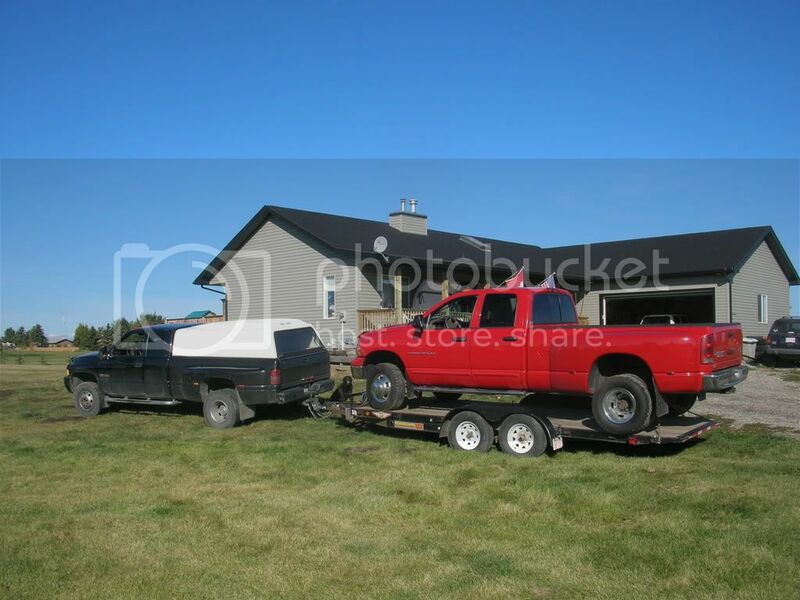 Clay, that truck looks really good.. and that trailer looks really small. Seriously, it looks like it is in great shape.. Nice find. I thought you said it was an automatic trans in your other thread about this truck but you mention 6 speed (manual) here. If it is a 6 speed manual, that is an awesome find. As for a new engine, I would 1st start dismantling the old one before yanking it. Pull the head and have a look. Perhaps you get lucky and just find a dropped valve in one hole and the short block is salvageable. As for a used/rebuilt engines here is one option in Kalispell. Pricey but these are fully dressed which you would not need. Good luck and keep us updated.. Thanks for the tips guys. Yes it is a 6spd, before I saw it I thought it was an auto but its not. Would prefer an auto(yeah I'm lazy) but for the price I think I can make do. How much power can the stock clutch and 6spd take? I have the Edge Juice w/attitude on my '01 and would like to put it on the new '03, website says it adds 150hp. I like the all in one package for the gauges and being able to change the HP level on the fly. If I have the engine out anyway I may as well put a HD clutch on if needed. Have heard that it runs hot EGTs when towing though, any comments? Anyone have it on an '03-'04? The turbo on the 03 is the small one, thats the EGT problem. If you are doing the engine transplant this may not be a problem anyway.